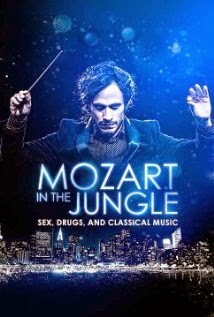 The first season of Amazon's new series Mozart in the Jungle is available now. It was released in it's entirety. I've seen the first three episodes and I'm enjoying it very much. Interesting, funny, love the music. It shows the behind the scenes of the world of the symphony. Favorite characters are Hailey, an oboist trying to make it in a very tough industry, Rodrigo who is what I expected, young, quirky and brilliant. People can say what they want about him but when it comes to music he is a genius. Also it's so great to see Bernadette Peters. I've loved her for years and she is wonderful in this. The episodes are only about 25 minutes which I kind of like. I definitely recommend checking it out.